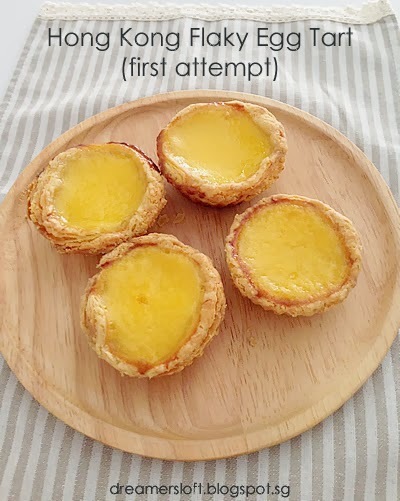 I believe the egg tart needs no elaborate introduction :) Basically there are two types of tart shell, the cookie-pastry base (饼皮) and the puff-pastry base (酥皮). My family loves egg tarts especially my son who can walloped 2-3 pieces at one go when we dine at dim sum restaurants. 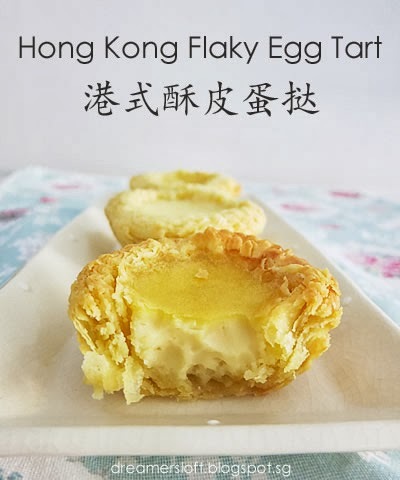 Decided to challenge myself to make the puff-pastry or flaky egg tart for Asian Food Fest Hong Kong/Macau. And it took me three tries to make a more presentable and tasty flaky egg tart that I can share here. I'm going to share a lot of details below, the recipe, as well as some pictures of the process. I know it's not perfect yet, but the best I could do for now. I have attempted the cookie pastry base egg tart before and it's more straight forward by combining all ingredients together to form the dough. Whereas, for the flaky tart, there's actually 2 doughs, a oil dough (油心/油皮) and a water dough (水皮). The combination of this 2 doughs attributes to the "thousand layer" crispy texture of the tart shell. 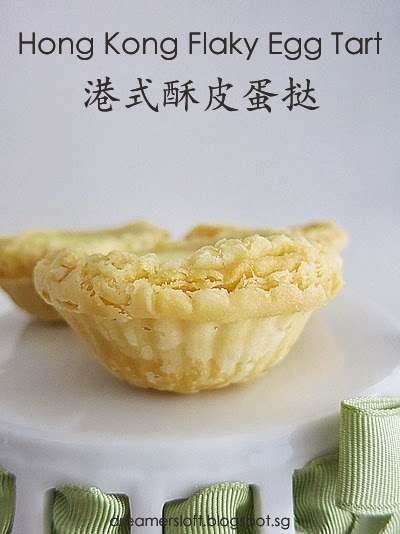 Therefore, to me the success of the flaky egg tart lies in the tart shell, it must be very crisp, appears to have "thousand layers" and the layers must be visible. The tart itself must be fragrant and complemented by a creamy, smooth and slightly sweetened egg custard. 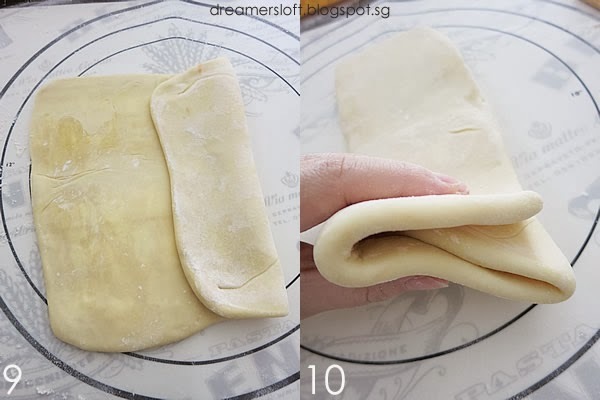 It's definitely not easy because like western puff pastry, the 2 types of dough are to be folded, rolled and folded at least 3-4 times in order to achieve the "thousand layers" crispy effect. 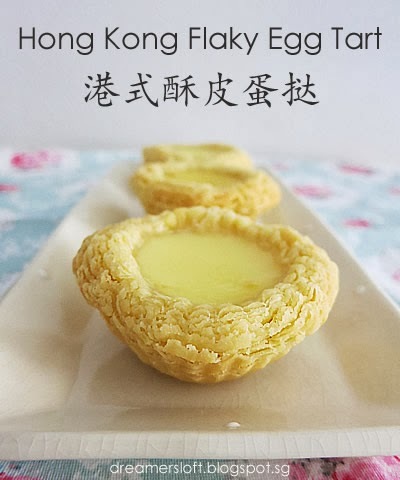 In fact, I've attended a dim sum hands-on workshop back in 2008 where one of the items I learned was the flaky egg tart. Back then I was still a noob in baking. 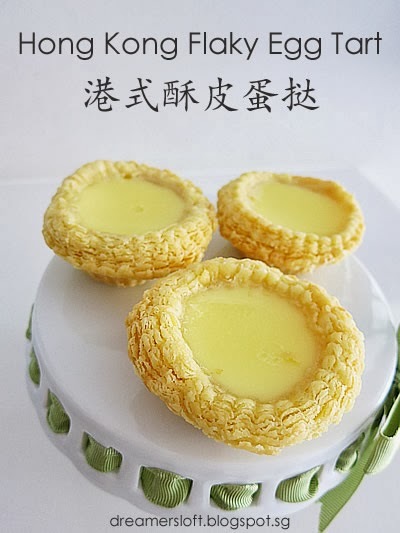 The notes given by the Chef were merely 7 sentences, less than 700 words and quantity for 200 pieces of egg tarts! I was seated at the back of the class, frantically trying to note down what he said while trying to watch his demo. It didn't help that the class was noisy because everyone was trying to ask questions and some stood up to see what's going on blocking those at the back etc. Well, after the workshop, I didn't have the courage to attempt the recipe until now. Prior to baking, I did a lot of research on various ingredients, methods and techniques, by reading different recipes posted by bloggers and watching several youtube videos to familiarize with folding techniques of the dough. Technique is pretty much similar, adopting 3x3x4 (i.e. 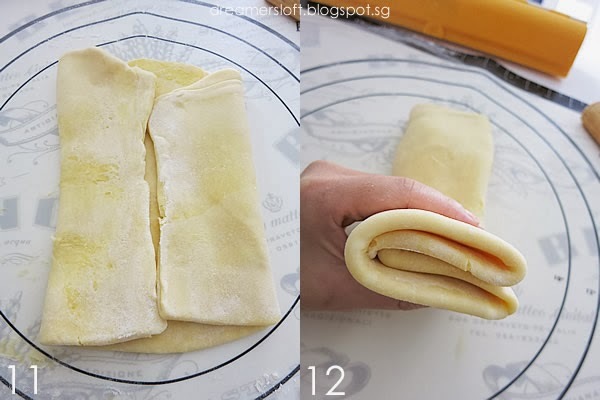 roll dough flat, fold into 3 folds, roll dough flat, fold into 3 folds again and finally roll dough flat, fold into 4 folds). However, in terms of ingredients, different proportions, types and even the temperature of baking. So in the end, I decided to adapt the one from the workshop because I remember it was very good, but I did some changes along the way as well. And so like I mentioned, there are 2 doughs used, the oil dough and water dough. Water dough is pretty straightforward, just combine all the ingredients to form a dough. As for the oil dough, some recipes use flour + butter, some use butter only, some use flour + shortening + butter, some use lard. 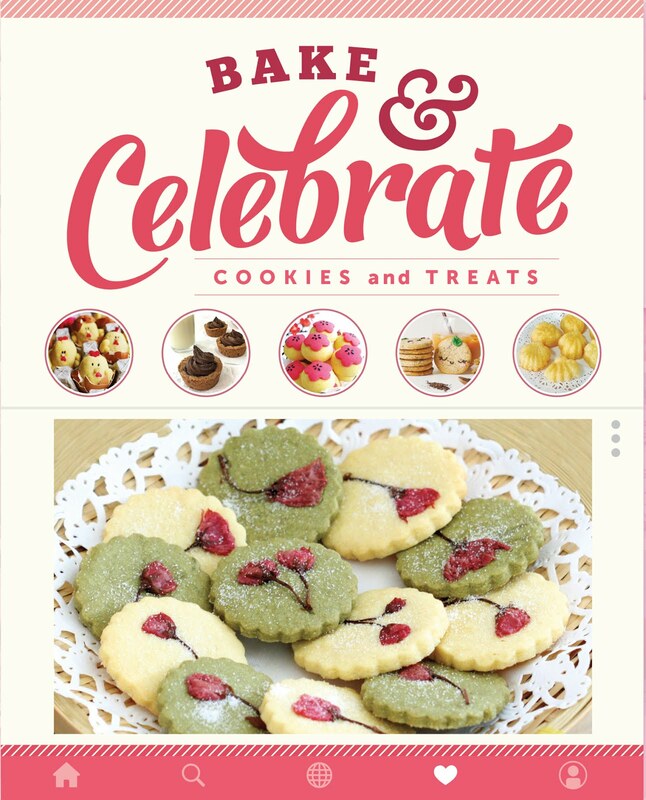 I've come across one recipe that uses flour + butter + vegetable oil (featured in magazine without any reference), not sure if it's really doable. The recipe I learned from the workshop uses flour + shortening + butter. The advantage of using shortening is it's more stable than butter (melts more slowly). So when you are rolling and folding the layers, the dough doesn't melt/break/fall apart that easily and you can achieve the 3x3x4 folding at one go. Whereas, if you use flour + butter, in between the folds, you have to chill the dough (15-20 mins), else the skin of the dough breaks easily. This was my very first attempt. I decided to use flour + butter for my oil dough. coz I was reluctant to use shortening. Being inexperienced and the hot and humid weather didn't help, the skin of my oil dough broke during the first fold and it became very messy as butter leaked everywhere (top, bottom, sides). Other problems like the cookie cutter I used to cut each piece of tart dough was too small, I filled too much egg filling etc. So it looked quite ugly and didn't taste crispy (a bit hard). For my second attempt, I made half recipe using flour + shortening + butter for the oil dough, and another half recipe using flour + butter. I wanted the flaky layers to look more visible (round cutter cannot achieve that) so I went to buy a set of fluted cookie cutters. Egg tart looked slightly better, but still filled too much egg custard filling; cookie cutter used still too short (I want to create more height in order to make the layers more visible) and temperature of baking too high. In terms of taste, the one that used butter won hands-down. It was buttery and very fragrant, whereas the one that added shortening tasted quite flat. And so, my third attempt, I decided to give the flour + butter dough another chance (skip shortening altogether). I made sure I chilled the oil dough sufficiently in between, dust the work surface properly with each fold, used a larger cutter to stamp each tart, filled the egg filling to about 70-75%, baked at lower temperature (staggered temperature control). All in all, the key ingredient was patience (because our weather is very humid and butter melts very easily). It was a long drawn process indeed. I also tested the egg custard filling with 2 different recipes, 1 using evaporated milk and another using fresh milk. In the end, the one using fresh milk turned out slightly better, more creamy and smooth. 1. Make the oil dough. Combine the flour and cold cubed butter in a large bowl. Use pastry cutter to press the butter into the flour until it forms a rough dough. Alternatively, use electric blender and pulse the mixture until rough dough forms. Work quickly so that butter do not melt. 2. 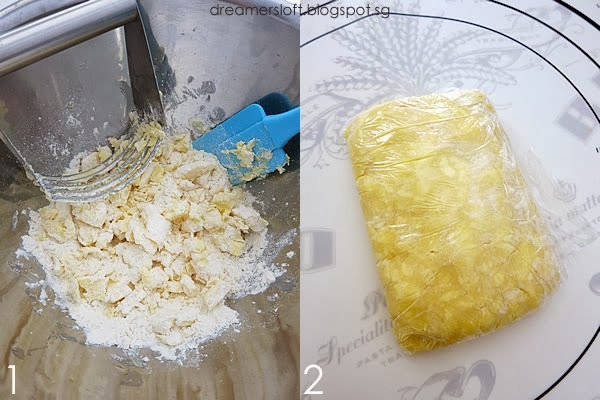 Place the dough on a piece of clingwrap and wrap it up into a small rectangle parcel (about 10cm x 15cm). Chill in fridge for 30 mins. 3. Make water dough. Combine all the ingredients into an electric mixer, and blend until a dough forms. Knead for 5 mins until dough is smooth (texture feels like ear-lobe). Mold into a rough oval shape, wrap in clingwrap and chill for 20 mins. 4. Take both water dough and oil dough out from the fridge. Dust the work surface with flour so that the dough will not stick to the work surface. Remove clingwrap (keep it aside). Roll the water dough into a large oval, make sure it has sufficient space allowance for the oil dough to be enclosed within. Place the oil dough in the middle of the water dough. 5. Wrap the water dough like a parcel, encasing the oil dough, make sure no oil dough is exposed at the seams. 6. Slightly flatten/roll the combined dough, dust with some flour top and below and wrap the dough in clingwrap. Chill in the fridge for 20 mins. 7. Retrieve the dough from the fridge. Dust the work surface and rolling pin with flour. Remove clingwrap (set aside), dust top and bottom of dough with flour. Roll the dough into half inch thickness in rectangle shape. Fold one side towards the centre (as shown). 10. Repeat step 8. This is round 2 of folding. 11. Retrieve the dough from the fridge. Dust the work surface and rolling pin with flour. Make sure to dust a larger surface area. Remove clingwrap (set aside), dust top and bottom of dough with flour. 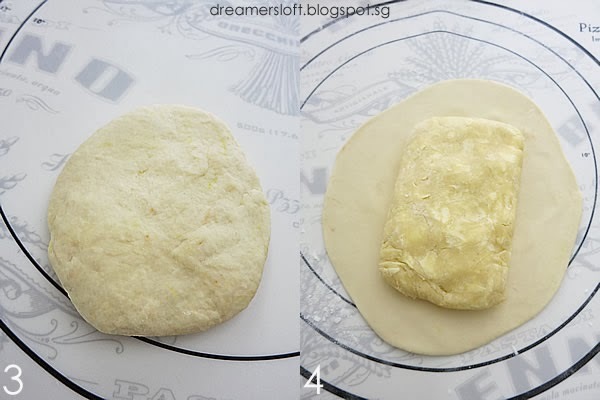 Roll the dough into half inch thickness in rectangle shape. Fold left and right sides towards the centre (as shown). 12. Fold one side of dough towards centre again. You will see 4 layers now. This is round 3 and final round of folding. Dust with flour, clingwrap and chill in fridge for 20 mins. 13. Retrieve dough from fridge. Dust work surface and rolling pin with flour. Place dough on work surface, dust with flour. Roll the dough flat into 0.5cm thickness. 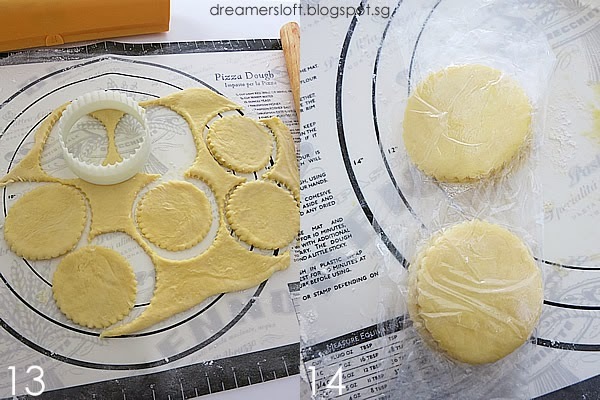 Use cookie cutter to stamp the dough into individual tart shells. 14. Wrap tart base using clingwrap (separate each layer) and chill in fridge for 15 mins. *At this point you could freeze the tart base for subsequent use. 15. Retrieve tart base from the fridge. Mold each piece into the tart casing, pressing down the dough towards the sides and bottom of the casing. Avoid touching the top part (perforated) else pattern will not be visible after baking. As you can see, I'm using a larger cookie cutter because I want to create height for the egg tart without having to "push" the base upwards (like some recipes do). Poke some holes in the tart base using a fork gently (not too hard else egg filling will leak). Chill tart base in fridge for 15 mins. Preheat oven at 220 degree celsius. 16. Prepare egg filling. Combine all ingredients of egg filling, make sure sugar is fully dissolved. Sieve the egg filling 2 times. Once tart base is ready, pour the egg filling into each tart to about 70-75%. 17. Place tray of egg tarts at the bottom most rack. Bake at 200 degree celsius for 15 mins. After 15 mins, bake at 180 degree celsius for 10 mins. After 10 mins, slightly open the oven door, slip a cloth or oven mitt by the door and let egg tart bake in residual heat for another 10 mins. 18. 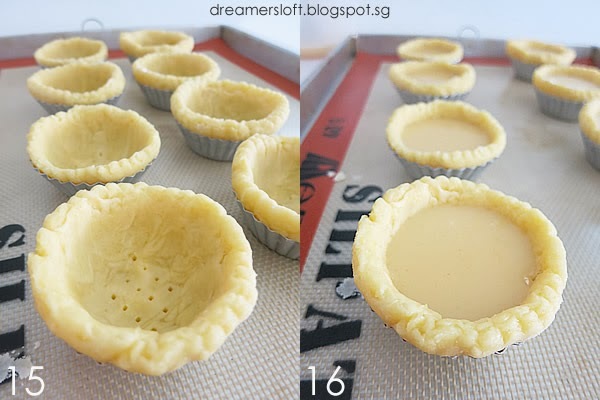 After 10 mins, remove the tray from the oven and let egg tarts cool slightly before removing the tarts from the casing. The ones on the left were filled with evaporated milk egg filling and the ones on the right were filled with fresh milk egg filling. Our family preferred the fresh milk egg filling. The egg tarts are best served warm. They remain crispy for a couple of hours in the open. If not consumed immediately it's best to keep them covered in the fridge. To re-heat, I just pop them into air-fryer or oven for a few mins and they will become crispy again! This recipe is definitely a keeper and perhaps I will try making mini ones like those served at dim sum restaurants. Meanwhile, let me enjoy this sinfully delicious pastry with a hot cup of chinese tea! Really love how flaky your egg tarts look. Fantastic job! I'd have to summon up some courage to try this too. Thanks Yen. Actually after attempting it, realised it's not that difficult after all, just need lots of patience and time! In between waiting, I just do chores or play games, so still doable :) Give it a try! Wow looks amazing great job, I'm definitely gonna have to try this one, was just wondering what did you do with the leftover dough after you cut out the shapes for the first time? Actually the leftover could be re-used, just that they might not be as nice and flaky. Can also roll into sticks or stamp small shapes for munchies. Hi Meg, this is an excellent recipe. I've tried it and the tarts turned out beautiful & they taste delicious too! Thank you for sharing the recipe & the tutorial. I would to share the recipe in my blog. Thanks. 10g egg means 10 gram of egg. I crack the egg, stir lightly for yolks and whites to mix, then take out 10 gram. 40g iced water is 40 gram, which is actually also 40 ml. 100g fresh milk is 100 gram, and I think slightly less than 100ml, maybe 95ml coz milk is more dense than water. 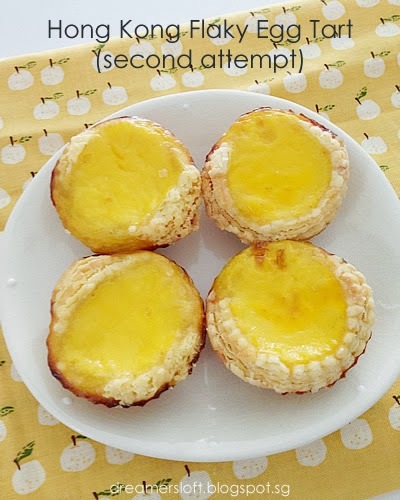 I tried out this recipe and the egg tarts turned out to be flaky and buttery. However, there's some crunchy bits in the pastry. Is this due to the bread flour ? And can i know what's the purpose of the custard powder? Hv you tried other recipe without the bread flour ? I'm not sure about the crunchy bits, probably some bits of butter and flour not well-mixed. The custard powder is to make the dough more short/light (some recipes substitute with corn flour). You can also try replacing the bread flour with plain flour. I just finished baking my egg tart and I must say your recipe is great. Tks for sharing. I must work on my shaping skills to perfect it. 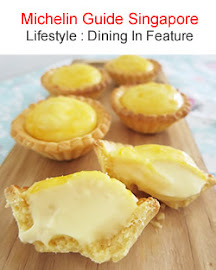 The filling is more than enough, coz each egg tart only needs little filling. I made more than 4 egg tarts, the rest not in picture. Hi, for step 7 onwards after every time we fold the sides towards the centre, do we need to roll it flat before chilling? Not necessary. Just chill after folding. Rolling flat is after taking out from fridge. Hi, ive tried baking it twice but still my filling always ended getting burned. How to prevent it? Place the baking tray at the bottom-most rack of the oven. Or try reducing the temperature by 10 degree. Is the water dough smaller than the oil dough? Cause from the measurements it seems like the water dough wwill be slightly smaller. Hi, I am already having difficulty at step 4. After taking out oil and water dough from the fridge, i proceed to roll the water dough into an oval as per instruction as large as possible. However, i found that the oil dough is too big to be wrapped fully by the water dough and even risk breaking the water dough if i force it. In the end i have to discard 1/4 of the oil dough to be comfortably folded into the water dough. What have i done wrong? Based on measurements the water dough seems smaller but it's actually "stretchable" coz of the gluten in the flour. So please roll the water dough thinly so that the surface area is larger than the oil dough. Try to compact the oil dough smaller. As for the water dough, try to knead longer so that gluten is formed and makes the dough more "stretchy", so that it can cover the oil dough. Make sure both dough are sufficiently chilled in the fridge, longer than 30 mins if needed. Flour the work surface generously, it will help if the water dough breaks through. It may take some practise, my first 2 tries some parts of the water dough also broke. When that happened, I dust with some flour to help. Hi, thanks for your recipe! I tried it but the tarts over bake too quickly. And the egg custard becomes very wrinkly. Do I reduce the temperature? Or is there something that went wrong in the process? Great recipe, but how do you get the look w/ all the layers for the crust- mine is just a single layer look. Your oven temperature might be on the hotter side. 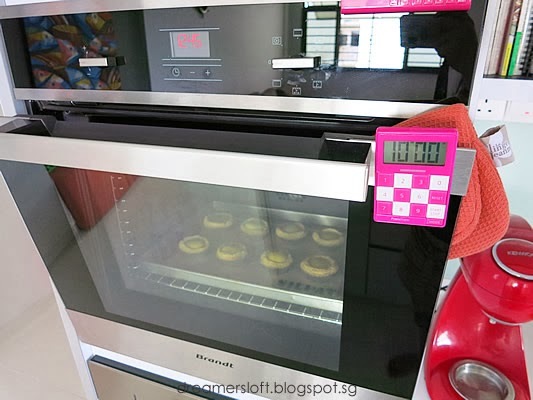 Try baking at 180 degree celsius throughout or 180 degree first, then 160 degree celsius. The folding and rolling of the dough is crucial to achieve the layering. Are you using a convection oven? My oven is not convection, just regular electric oven. 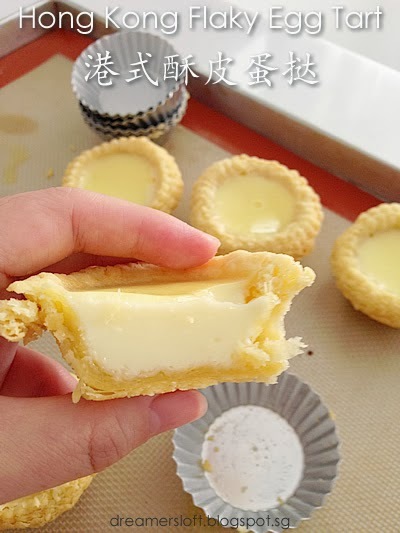 The bottom crust on the inside (beneath the custard) seems like it is not cooked. Any ideas on how to fix this? Have you ever tried prebaking the shells a little bit before pouring in custard? My oven is a built-in type about 60L. I've not tried prebaking shells. You may try to bake the tarts at lower temperature and longer time. See if it works. Flaky pastry was excellent but layers didn't separate as well as yours. Maybe due to blunt cutter? Tops also wrinkly but will reduce oven temp next time I have a spare 3 hours! Yes, you can try using cupcake tray. But you may have to adjust the height of the pastry as normal cupcake tray is deeper than these individual metal casings. Hi, I'm not sure where to get them in UK as I live in Singapore. Perhaps you could order from Amazon.com? Just search under "mini tart tins". Hi, I supposed you could use water, just that the custard will not be creamy and fragrant tasting. Alternatively, you could try using soya bean milk. Incredible layers there. I had a little attempt with making the pastry, not entirely using the same amount of butter, but the folding technique was followed. And i acheived the mutiple layers rolling the pastry dough out. But wasn't sure if I failed because I used a knife to cut out the base, or I couldn't line them properly onto the little cups without very thick folds overlapping. I didn't get any of the layers around the edges and my custard was overly cooked with pastry under cooked. If you ever have time to do this again, I would love to see a clip that can showcase your nice skills. Thanks again, you are inspiring. 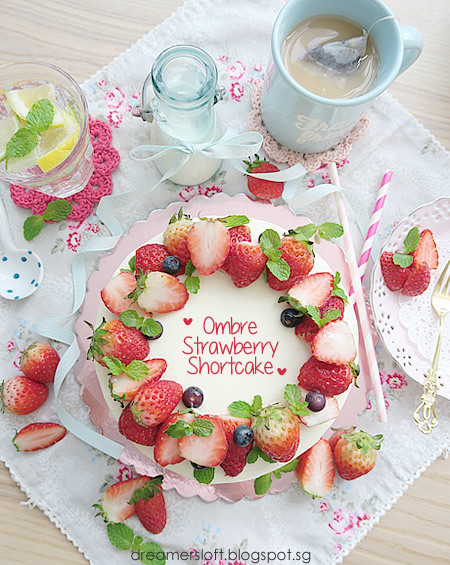 Thanks for visiting my blog :) I agree that the pastry is quite tricky. Butter is the ingredient that helps in creating the layers, but it's also difficult to work with since it melts very quickly. Molding the pastry into the cups must be careful coz if overhandled, may lose the layers around the edges. Understand the frustration, I went through a few times before the successful attempt. I'm not good at video taking/editing, so not sure if I could do a clip. But what you could do is to search on youtube for similar videos. I also watched quite a few to learn about the technique. Hi I am half way through the recipe, stuck with the egg filler. Do I need to dissolve sugar in water & how much? Hi, for option with fresh milk on filling, how does the sugar dissolved? In the fresh milk or water (100g) as per option 2 with evaporated milk? I was wondering what is a perforated cookie cutter, I think you mean a scallop-edged cutter as opposed to a plain cookie cutter. Perforated means full of holes. If you are using option 1 - fresh milk, dissolve the caster sugar into the fresh milk, keep stirring, sugar is easy to dissolve in liquid. If you still find it hard to dissolve, try heating the fresh milk very slightly. If you are using option 2 - evaporated milk, dissolve sugar in water first. Sugar should dissolve in water very easily. For option with fresh milk filling, dissolve sugar directly in milk. Keep stirring, the sugar should dissolve. If not, try heating the milk very slightly. Sorry, my bad. It should be fluted cookie cutter. Have updated. Thanks for informing! 1. The thousand layer seem appeared nicely especially when I used the fluted cutter but they are thick, crispy still; I even try 3,3,4,4 folding but still not thin, how to make it thinner? 2. 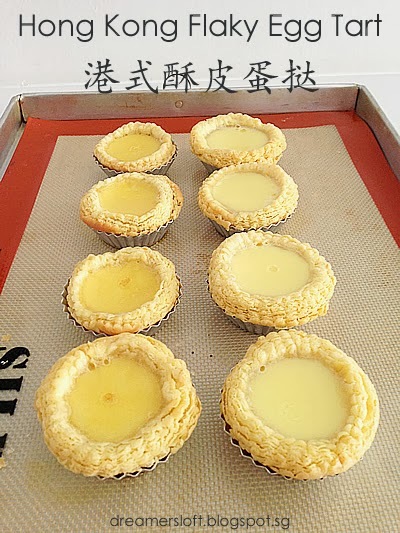 During baking time of 180 degree for 10 min, the egg custard rose like a half moon but when finished baking, it sank and craters appeared on the surface. 3. My egg custard has a skin, the texture seems overbaked, it's not as smooth and wobble as it suppose to be, I use option of full cream milk, would adding water to the custard advisable? 4. The skin colour more like cookies, it's not the same colour as shown in your picture, what can I do to improve? 1. I rolled each dough into 0.5cm thickness. If you would like the tart to be thinner, try 0.4 or 0.3cm? 2. My egg custard also rose like half a moon, and sank after done. 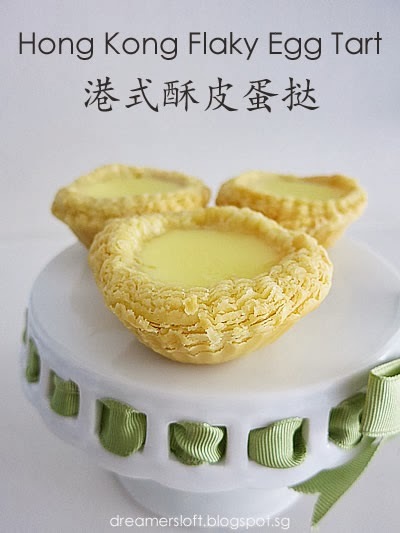 To prevent from sinking further, do not remove the egg tarts after baking, let them cool inside the oven. 3. You can try adjusting oven temperature (some ovens are hotter, while some cooler, may not be the exact temperature as tuned), bake at lower temperature for longer time. Adding water may make the custard more wobbly and smooth, but the taste will be less creamy. 4. Like mentioned in point 3, adjusting oven temperature may help. i'm unable to find custard powder in my local store. can i disregard that? or can i use Jell-o brand custard powder in replacement? You can either take out this ingredient since it's just 5g, or replace with corn starch. Hi, just wanted to say that your recipe is pretty awesome! The dough really tasted like the originals from hong kong :) Its a bit time-consuming but 100% worth it! Thank you! Glad you tried and successful! Hi, I am considering to bake this, should I bake it in top and bottom heat or fan oven? I use top & bottom heat.